Agco takes the wraps off it's new Super 7 line of combines. First full farmer viewing to be at the Farm Progress Show. Machinery makers are facing a new challenge: Matching their equipment to fields where bin-busting crops are now the norm. For combine makers that's especially true, as farmers are on course for 300-bushel corn yields and 100-plus bushel soybeans. 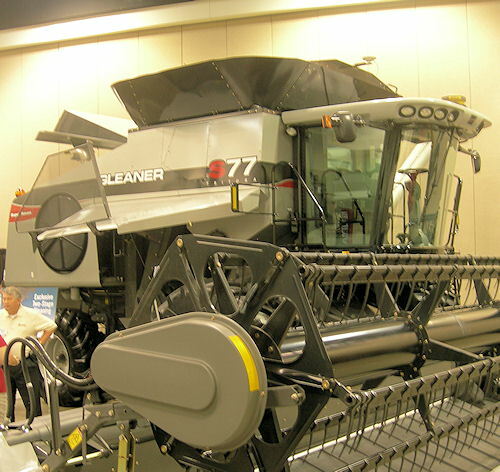 And each equipment maker will approach the opportunity in its own way - for Agco, the Gleaner combine line offers its unique approach to harvesting, and for 2011 there will be a new, 'super' machine on the market. GRAIN HANDLER: The prototype Agco Super Seven combine, decked out in black, ran the custom harvest route in 2010 for farmers to see it in action. With more than 30 significant changes from front to back, the machine is an optimized performer. Over the past three years, the company has been making more than 30 interior changes to the combine line, culminating with the S7 series of machines. Farmers got a sneak peek of the line with the Super 7 prototype making its way north with the wheat harvest in the spring, and into corn and soybean harvest for the fall. It's a unique marking approach for the company. "It's the first time we've used social media - like Facebook - to promote equipment," says Kevin Bien, combine marketing manager, Agco. You can check out more on that HERE. The short video on this page shows the prototype at work, note the way it handles chaff off the back in what was damp wheat. 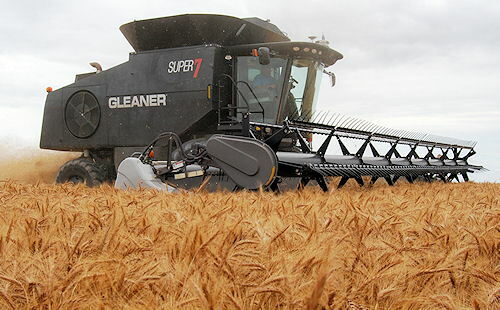 The newest Gleaner retains what Bien calls the line's unique threshing approach - the transverse rotor. First introduced in the 1970s, he points out it remains a unique machine on the market. And the company acknowledges that while the machine was a champion in small grain harvest situations, it needed some work to enhance performance for more crops including corn and soybeans. FINAL TRIM: While farmers might recognize this combine better in black, the new S Series Gleaner combines from Agco do get the familiar silver paint job. The S series machines will be the first combines on the market with new Tier 4 engines too. Bien, an energetic industry veteran, is excited about this new combine. He notes that the 30-plus changes made to the original R series are making a difference. "We touched each of those points once, improved it, and moved on," he told a small group of editors during a field visit in Western Kansas during that prototype sneak peek. "We wanted to improve every part of this combine." To the casual observer, the new Super Seven series of combines doesn't look a lot different than the R-series predecessors. The cab isn't changed much, and the overall shape stays the same - and perhaps the biggest news. "We've been able to enhance the productivity of this machine in all crops, and we haven't changed the footprint," he notes. Gleaner could already lay claim to having the largest bin size with the R series, and that gets a boost for 2011 in the S-series. LATIN REFERENCE: The new series carries the "Tritura" name, which Agco says means "threshing" in Latin. In fact, the S7 series weighs in at 31,000 pounds, about 5,000 pounds lighter than the next nearest competitor. That "productivity-per-pound" measure, which is new to the harvesting business, will become important Bien asserts. "During tests with this combine in the field, we could get in earlier than competitive models because of the weight difference," he notes. It's impossible to run through all 30 changes in the new S Series combines in this space, but the rotor diameter has been increased from a 25-inch diameter to a 30-inch diameter and offers 360-degree cleaning. The machine offers efficient two-stage cleaning that maximizes machine horsepower, and the "straight-through" material flow design improves efficiency. That flow, long a hallmark of the transverse rotor, becomes a market advantage, he notes. Agco will offer four combines for the 2011 season - two familiar R-Series machines with Tier 3 engines - and two new S-Series machines offering the first interim Tier 4 engines to the combine market. The S - or Super - series will be known as the Tritura machines, which is Latin for Threshing. For the R series there is the 66 with a 300-bushel bin and a 300 horsepower Tier 3 Sisu diesel. The 76 will feature a 350 hp Sisu diesel and a 330-bushel hopper. For the Super - or S - series, the 67 will feature a Tier 4 314-hp Sisu diesel and an base 300-bushel grain tank, that can be expanded to 390 bushels. The top-of-the-line 77 will feature a 370-hp Sisu diesel along with a base 330-bushel bin which can expand to 390 bushels. Combine classes are based on horsepower ratings, not bin capacity or even throughput capacity. The S67 is a Class VI machine, while the S77 is a Class VII machine, but chances are that new machine will give heavier, higher priced Class VIII machines a run for their money. As one Agco official commented when asked if the S77 would be Class VIII performance in a Class VII package: "We prefer to under-promise and over deliver."